I wish I had had this book 30 years ago, when I began to study missiology at the University of South Africa (Unisa), as it would have helped to make sense of much of the course material that went right over my head. The course material kept mentioning the “current mission model”. which it said had to go, and be replaced by a “new mission model”, but the “new mission model” they referred to was the only one I knew, and was what I thought of as the “current model”. The trouble was that the course material never explained what the “old” model was, and assumed that students just knew that. So it left me with the impression that the current model had to be removed and replaced with one that looked just like it. David Thomas’s basic thesis is that there were two models of mission in South Africa. and that they behaved in unexpected ways. The first model was the “missionary society” (and this is the model I now realise was assumed by the Unisa missiology courses). In the mid-19th century mission stategists, like Venn, of the Church Missionary Society in England (Anglican), and Anderson, of the American Board for Foreign Missions (Congregationalist) said that the aim of Christian mission in far-away places where there were no Christians was to establish self-governing, self-supporting and self-propagating churches, and once that had been achieved the missionaries would pack their bags and move on to the “regions beyond”. It didn’t seem to be part of the plan that churches thus established by missionaries would themselves send missionaries to the “regions beyond”. But this was known as the “three-self” missionary strategy. The New Imperialism, which spread after the 1870s, put the kibosh on this. It resulted in a new breed of Western missionaries who were control freaks, and were determined to control the churches they established for the foreseeable future, imbued as they were with the notion of the superiority of their own culture, and the fitness of their nations to rule all others. Thomas then speaks of another kind of mission vision (and this was what was absent from the Unisa missiology courses), which in South Africa was mainly exemplified by Anglicans and Methodists. The Methodists seem to have fallen into it for pragmatic reasons, but in the case of the Anglicans it was the result of the Anglo-Catholic high church ecclesiology. That was based on the idea that “where the bishop is, there the church is”. In South Africa, the Anglican Church became “self-governing, self-supporting and self-propagating” in 1870, though for another 80 years most of its bishops, and most of the money for mission would come from overseas. But the strategy was decided by bishops in South Africa, and not in the headquarters of overseas missionary societies. The Anglican Church in South Africa worked on the principle of missionary bishops (as did the Roman Catholics, who called their missionary bishops “vicars apostolic”). In Namibia, for example, the South African bishops sent a missionary bishop leading a missionary team into the country. It was like a pre-fab church that they took with them and erected in the new place. Thomas’s thesis is basically that the second model, which he calls, somewhat misleadingly, I think, “liberal”, dominated the ecumenical scene in South Africa until about 1970, and controlled the Christian Council of South Africa (CCSA), and its successor the South African Council of Churches (SACC). But in the mid-1970s churches that had been founded by foreign missionaries on the “three-self” principle (mainly Lutherans) began joining the SACC in increasing numbers, and that these swung the balance of power in the SACC from the “white liberals” to the black proponents of “black consciousness”, mainly from the three-self churches, and this turned the SACC into an agency for black liberation. Thomas describes this as one of the “unintended consequences” of the three-self model of mission, developed 150 years ago in Britain and America. He rightly points out the way in which what he calls the “liberal” group regarded with suspicion the mission society group, dominated as it was by the “ethnic theology” of German missiologists like Warneck. And this led, as Thomas points out, to the children of German missionaries, like Eiselen, becoming the architects of apartheid. Perhaps that too was one of the unintended consequences of German mission. Thomas talks much of “unintended consequences”, though I think some of his examples are a little forced. Unless I have greatly misunderstood it, I don’t think that the “three-self” model was as diametrically opposed to the Anglo-Catholic model as Thomas makes out. Certainly the Anglo-Catholic model could not tolerate an ecclesiology of racially-separate churches, though it could tolerate them at the congregational level for pragmatic reasons, not all of them honourable (one of the pragmatic reasons, for example, was white racism, but this was regarded by Anglo-Catholic missionaries as something to be overcome eventually, rather than made an aim or ideal, as in an ethnic church). Anglo-Catholic missionaries did not have objections in principle to the “three-self” model, and they applied it in East Africa, for example, where the Universities Mission to Central Africa (UMCA) started off with missionary bishops, but their aim was to plant self-governing, self-supporting and self-propagating churches. That was because in the places where they worked there were few white settlers, and the church was predominantly black. The Church Missionary Society (CMS) faced similar situations in places like Uganda and West Africa. Thomas does not seem to be aware of the work of the UMCA, which united with the Society for the Propagation of the Gospel (SPG) in the mid-1960s to form the USPG. I also do not think that the “liberal” group were as wedded to assimilation as Thomas seems to think — the idea that Africans must become black Europeans. If, as Thomas claimed, it was the heirs of the “three-self” ethnic theology who turned the SACC into an insturment for black liberation, then one of the unintended consequences of that has been assimilation. Many of the black elite in South African society speak with Woozer or “Model C” accents. And the cultural similarities between yuppies and fat cats, white and black, seem far greater than those between them and their poorer compatriots, black and white. One of the most ironic unintended consequences of all, which the Victorian moralists could hardly have foreseen, is that the Africans whom they went to rescue from darkness and immorality are now turning around and teaching the descendants of those same moralists lessons in Christian sexual morality. Thomas does very well to raise some points that have been neglected in South African church and mission history, and even John de Gruchy‘s updated The church struggle in South Africa, which I also re-read and reviewed recently fails to pick up some of Thomas’s points. But I nevertheless think that Thomas misses some important points, and seems in some places to draw the wrong conclusions from his data. The above is taken from my review of the book on the Good Reads web site, but perhaps on my blog I can add some more personal notes that do not necessarily apply directly to the book. I mentioned that I found the discussion of mission models in the Unisa study material confusing. Perhaps I should explain where my own mission model was formed. From 1963-1965 I was a student at the University of Natal in Pietermaritzburg, and a member of St Alphege’s Anglican Church in Scottsville, which was close to the university. St Alphege’s was known as the “high” or Anglo-Catholic parish in the city. When I first went there the Rector was Mervyn Sweet, from England, and there were two assistant priests, Rich Kraft, from the USA, and Graham Povall, a South African. In 1963 there was a mission led by John Davies, the Anglican chaplain at Wits University, who introduced the ideas of the parish meeting and the house church, as he had experienced them in the parish of Halton, Leeds in the 1950s (the book to read is The parish comes alive by Ernie Southcott, though it is long out of print). This introduced the idea of “every member ministry”, and the idea that we must be the church in order to build a church. After the Anglican Congress in Toronto in 1963 the parish council studied the documents of the congress, with the unwieldy title of Mutual responsibility and interdependence in the Body of Christ. David Thomas does mention this document in his book. It promoted the idea that mission begins with the parish in its neighbourhood, and in the society around it. This was interpreted in the framework of the idea of the parish as a community, based on the parish meeting, and the smaller neighbourhood groups — house churches. The Roman Catholic church in South America developed a similar idea of “basic Christian communities”, or, more accurately, “Christian communities of the base”. At the end of 1964 Mervyn Sweet left and returned to England, and a new rector arrived at St Alphege’s. He had much more clericalist ideas of ministry, and his arrival led to speculation that he had been deliberately sent by the bishop to kill the kind of populist Christianity that had been growing at St Alpheges. The parish council resisted. At one meeting there was a ding-dong battle between the council and the new rector, who had held a private baptism. The council said in effect, that if new members are joining our community, we want to know who they are and we want to welcome them into the community. The Rector saw the church as a wheel with spokes, but no rim, and himself as the hub. All the members were like spokes that connected with him, but did not connect with each other. He once complained that people in the parish were luke-warm Christians, because they did not do church work — like arranging flowers and such. Someone tried to point out that they did church work in their daily lives outside the church. Some fed the hungry, and worked as volunteers in organisations fighting malnutrition. Some witnessed to the gospel in their places of work. Some were members of political and semipolitical groups fighting injustice in society – groups like the Black Sash and political parties. The new Rector did not see these as “church work” or Christian ministry. And though this goes beyond what David Thomas claims to be doing, since he is mainly looking at official bodies like councils of churches and the like, it is vital for understanding Christianity and Christian mission in the period that he looks at. He mentions Arthur Blaxall, who was secretary of the Christian Council of South Africa for a while. But he does not mention Trvor Huddleston, whose book Naught for your comfort I also recently re-read, and reviewed at Tales from Dystopia V: Sophiatown and ethnic cleansing: Khanya. Huddleston explained very clearly, from the point of view of Anglo-Catholic ecclesiology and Christology, why the ideology of apartheid was not merely sinful, but blasphemous. And the new rector of St Alphege’s would never have understood the Christian ministry of people like Oliver and Adelaide Tambo, faithful Anglicans whose ministry, though not carried out within the walls of a temple made by hands, nevertheless arose directly from the new birth in water and the Spirit and the four-fold action that takes place on the altar. 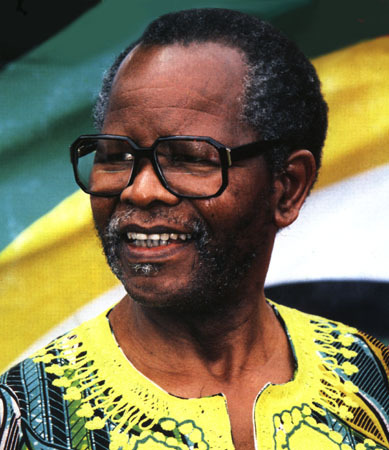 I sometimes think with sadness that Oliver Tambo never lived to see the birth of the free South Africa he fought for so long, but also think that perhaps it is a blessing that he also never lived to see the ANC descend to the petty moneygrubbing fighting over the spoils of office that seems to characterise it today, if all the media reports are to be believed. And then there is the question of assimilation. Thomas claims that the “liberal” idea was that of assimilation. Thomas (2002:77) accepts a general definition of liberalism that is accurate as far as it goes — that liberalism is basically about access to justice in the broadest sense of the term, freedom of speech, economic freedom, and political rights. “Assimilation” does not form part of that, and Thomas goes on to speak of “neo-liberals” in a rather misleading way, while acknowledging that the term “neoliberal” nowadays refers mainly to those who advocate economic freedom without paying much attention to the other three aspects of freedom, and sometimes even at the expense of the other three; Thomas nevertheless uses it in a different sense. Perhaps the prototypical, or archeytpical assimilationist missionary was Sheldon Jackson. I’m not sure whether I would call him a “liberal”. His determined attempts to eradicate every trace of the Orthodox Christian culture of the Alaskan natives doesn’t quite accord with the liberal value of religious freedom. So I think that when it comes to “assimilation”, Thomas is guilty of oversimplifying. Nevertheless, I think the book is definitely worth reading, and fills an important gap in South African church and mission history. Woozer, from WUESA – White Urban English-speaking South African. Please supply me with your email address. I woulld like to email our 24year research and study findings on the subject of division and falsehood in the church today. Thank you.